Can the HP Officejet 7500A Wide Format printer be refilled with ink manualy? If the answer is yes, how? We don't have a refill kit that's suitable for refilling the HP 920XL ink cartridges that work in the Officejet 7500A Wide Format printer so we wouldn't be able to advise you on how to do this or recommend that you try to refill these cartridges yourself. However, we do sell compatible HP Officejet 7500A Wide Format ink cartridges which have already been professionally refilled for use in this printer as a cheaper alternative to the genuine HP ink cartridges. I've connected a new computer to my Officejet 7500A printer, how do I get it to operate? Is it possible to get a replacement installation disc for our HP Officejet 7500 Wide Format as we've mislaid it? Unfortunately, we don't supply installation discs, we only sell HP Officejet 7500A Wide Format printer cartridges and consumables. Are the cartridges for the HP 7500A Wide Format printer refillable? We don't sell a refill kit for the HP Officejet 7500A Wide Format printer so we wouldn't be able to advise you on how to refill these cartridges. However, we sell premium brand recycled HP 920XL ink cartridges for the Officejet 7500A Wide Format printer which have already been professionally refilled and cost less than the original HP cartridges. What if these HP Officejet 7500A wide format cartridges fail to print or what if the printer rejects the cartridges? Whether genuuine or compatible, our Officejet 7500A wide format ink cartridges are very reliable and should be immediately recognised on installation. If you do have any problems with any of the inks you purchase from Cartridge Save please feel free to call our award winning customer care team who will try to resolve the problem for you. Failing this, our 30 day money back guarantee ensures that you'll always be offered a replacement or a refund for any faulty or unsatisfactory goods. I have an Officejet 7500A wide printer. Do you have suitable compatibles for the HP 920XL? If so, what is the price of the colours and the black? Many thanks, Robina. Yes, our compatible HP 920XL ink cartridges are listed above with current prices. The compatible HP Officejet 7500A printer cartridges are easily identified as they have 'Premium brand recylced ink cartridge' written beside the image of the cartridge. Delivering professional documents and coloured prints, the HP Officejet 7500A Wide Format is an economical choice for small businesses. This printer offers networking via Wi-Fi and wired Ethernet. It has memory card slots and it can print documents of up to 13 x 19. However, this all-in-one does not have an automatic duplexer. The HP Officejet 7500A Wide Format is ideal for average-use offices. This sleek printer comes in black and has a small LCD screen. On top is the flatbed scanner and the auto document feeder. The easy-to-use control panel and a convenient ink indicator make operation a breeze. Businesses can increase their productivity while cutting running costs with the HP Officejet 7500A Wide Format. It features an automatic document feeder for scanning, copying, and faxing, and provides scanning and faxing to PC or e-mail option. Printing without a PC is possible, as the HP Officejet 7500A Wide Format has memory card slots and can also connect to mobile devices. This Energy Star device uses less than 40% energy than laser printers. 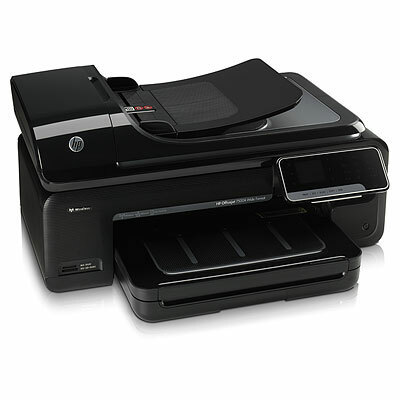 The HP Officejet 7500A Wide Format does not have a USB slot or an automatic duplexer. The input tray has a low paper capacity  only 150 sheets  and the text quality is adequate but may seem poor compared to the quality produced by competing printers.